Mushrooms and toadstools and other fungi that grown in grass, meadows or pastureland. A recent email query regarding this ‘not so often‘ seen mushroom, encouraged me to feature it today, having forgot to do it last year! The mushrooms shown here are from last June. The Milky Conecap (Conocybe apala) is one of the most common Cone Caps – which I don’t often see! And this is probably due to their short ‘blink and you’ll miss it‘ lifespan. Not long after heavy rain they will appear and after a dose of strong summer sunshine, will quickly dry out and eventually disappear. So it’s understandable that they’re not often reported. If you do happen to spot them during their brief existence it will be any time from June until October, mainly in short grass on lawns, parks, grassy roadsides etc. They will last no longer than 24 hours (at least in any recognisable state) and this is due to their extremely fragile nature; the flesh can easily break and crumble once handled. The name Conocybe simply translates from the Latin as ‘Cone Head’. Aptly named you’ll no doubt agree, and ‘apala’ describes this particular species as soft or delicate. The width can be up to 1.8cm and the conical height up to 3cm. When young, the milky white caps often show soft hues of ochre, most noticeably at the apex. Faintly smooth wrinkles cover the surface and appear more defined at the margin where the flesh often splits. As they age, the caps expand slightly into a subtle bell shape and become more fawny before eventually falling apart. The stem which is coloured the same (up to 6cm long) is also extremely delicate, and on closer inspection you will notice minute graining near the apex just before the pale gills (which mature rust coloured). These gills are narrowly attached to the stem (adnexed) but can also sometimes be unattached (free). Most Conocybe’s have unknown edibility or are regarded as suspect. Some have psychoactive properties and at least one is deadly (Conocybe filaris). So it goes without saying that no Conocybe is good for the pot, but it’s always good to know what you’ve found. Look out for them this summer after a good downpour. Happy hunting. Milky Conecaps (Conocybe apala) found in short grass by the roadside. Notice the fine granular texture of the stem at the apex (bottom right). 0.7-1.8cm x 6cm. Milky white (often with ochre patches). Smooth with fine wrinkles. Very fragile. 0.3cm x 6cm (max). Pale, milky-white. Fragile with fine granular marking at the apex. Spore Print: Rust-brown (see how to take a spore print here). History has it that on this day in 1415 St.George’s Day was declared a national feast day. And if you’re lucky enough, you may find the perfect ingredient in the form of Calocybe gambosa, commonly known as St.George’s Mushroom. This is one of the few edible species (of the larger kind) to be found in spring, and April 23rd was a convenient date to choose for its common name. They appear around this marked event, although in most cases they often arrive one or two weeks later, continuing to fruit until mid-June. Their typical habitat is pastureland, but they also frequent grassy roadside verges and woodland edges, often in small to medium sized groups. 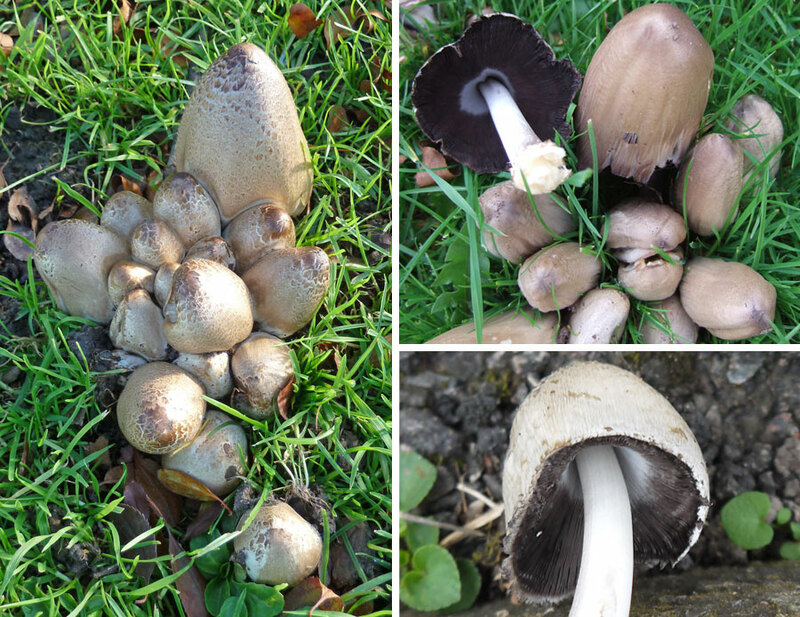 At any other time of year (mainly the mushroom season in autumn) white gilled mushrooms (or ‘whitish’ as in C.gamboasa’s case) tend be untrusted, and for good reason too; many potently poisonous species share the same coloured gills. But during the spring season, there’s not too much the St.George’s Mushroom can be mistaken with. Along with checking all the identification traits it’s also good (especially in this case) to check out the smell. The mature, fresh specimen will have a strong ‘mealy’ scent, which is an old fashioned term often used in describing certain mushrooms odours. It is hard to define but is often described either as fresh cucumber, watermelon rind, or an old grain mill. You’ll understand after a quick sniff! Other features to note are the medium to large white dome like caps (becoming off-white with ochre hues) are sturdy and fleshy. They expand flatter with age, with an irregular wavy edge. The margin is always inrolled slightly. The gills (also off-white) are sinuate, narrow and densely crowded. The white stem is chunky and solid (with no ring present) and can be up to 4cm thick. It goes without saying that the St.George’s Mushroom is a most welcome site for any forager, especially at this time of year. Highly prized, not only for its taste but also its flexibilty; it can be dried, pickled, cooked or even consumed raw. I don’t recommend eating it raw really, not because of digestive upset, but simply because it tastes (for want of a better word) ‘orrible! They’re best gently sautéd for quite a while due of their tough, fleshy nature. I wish you luck in finding some this spring. St.Georges Mushrooms. One of the first large edible mushrooms of the year. Growing in pasture, grassy fields, verges and woodland edges from April to June. Note: Top right image: By chance, I saw some 18 hours after this post – on a grassy verge of a quiet side street. Great! 5-15cm across. Domed, then expanding. Margin is enrolled and often wavy. White to off-white colour (some ochre with age). 3-7cm x 1-4cm. White, solid. Often curved towards the base. Whitish, sinuate. Narrow and very crowded. Pasture. Grassy verges, woodland edges. April to June. Edible. Very Good. Can be dried, pickled, cooked or eaten raw. *Extra Photo credits: Many thanks to Wiki Commons for the use of these images. 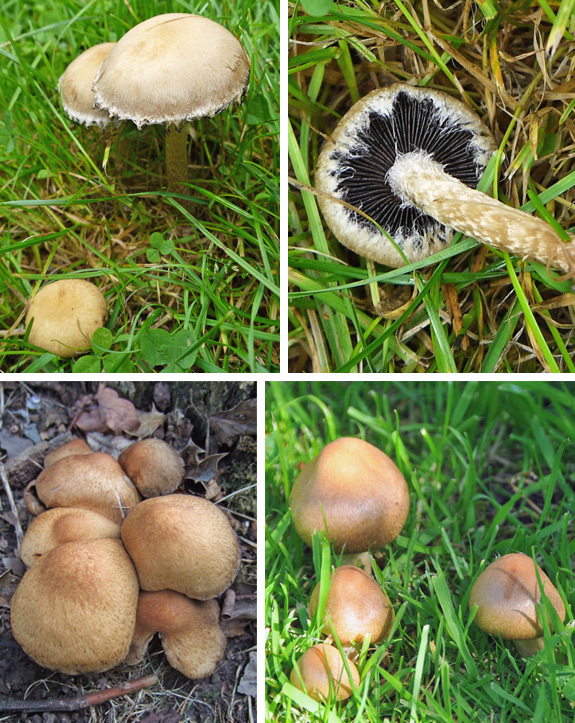 Authors: Andrew – originally posted to Flickr as St George’s mushrooms, CC BY 2.0, https://commons.wikimedia.org/w/index.php?curid=6829007 (centre images: top left), Strobilomyces (centre images: bottom). We’re at the beginning of summer and have had some decent, warm sunny days and a reliable source of showers – apparently perfect conditions for this summer/autumn Agaric which has shown itself somewhat early. Great news for all foragers who fancy a fry up! This small group of Macro Mushrooms (Agaricus urinascens / A.macrosporus) were found on a grassy roadside verge, not far from some fields and a small wooded area. They’re also found in similar environments such as pastures, woodland edges and grassy woodland clearings. My initial analysis was to rule them out as Field Mushrooms as these are strictly pasture/field bound, away from the tree line. There was no stark, chrome yellow staining as I scored the flesh, so they weren’t Yellow Stainers either. Horse Mushrooms maybe? Horse Mushrooms and Macro Mushrooms thrive in similar habitats, although the Horse Mushroom is not linked to woodland/tree situations. But they look much the same, especially when it comes to size; with an average cap diametre of 10 – 25cm. It has been known that the Macro Mushroom can grow up to a massive 30cm across – but this humble group were averaging around the 15cm mark. The cap of the Macro mushroom is distinctively scaly with many ochre coloured patches. The margin also tends to naturally become toothed and/or split. It rarely opens to become flat like the smooth cap of the Horse Mushroom. The veil covering the gills on the underside (when young and unbroken) shows a similar cog wheel style pattern as the Horse Mushroom but is not as defined. 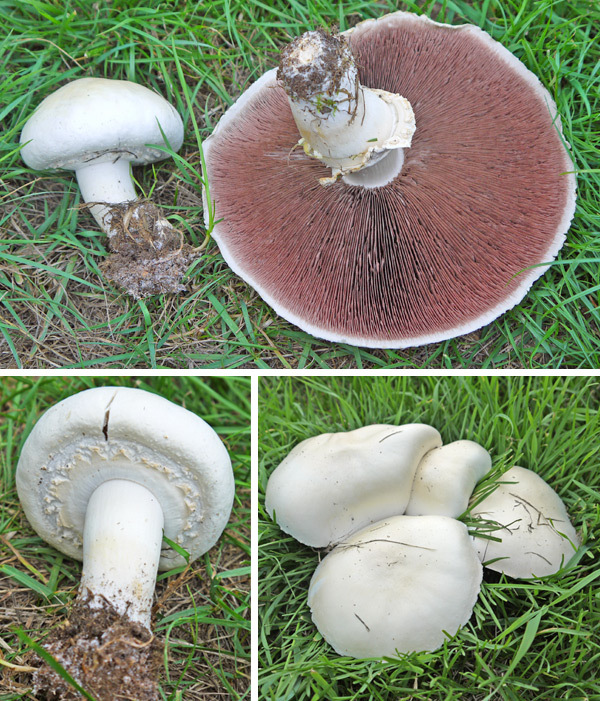 The gills are at first greyish-white which then mature to dark brown, unlike the ‘white to pink to dark brown’ colour changes of the Horse Mushroom. The Stem is distinctly scaly towards the base, and has a delicate/fine white particle coating all over. The stem on the Horse mushroom is relatively smooth. The odour of the young Macro Mushroom is like almonds, becoming more ammonia-like with age. The Horse Mushroom has a mild aniseed-like odour. One thing also to note though is that a variety of A.urinascens is also recognised, known a A.excellens. It’s even more of a Horse Mushroom lookalike, but is just as edible. Its cap is much smoother with only minute scales present and it does not grow as large; having only an average cap diametre of 10-15cm. The good news is that all of the above mentioned Agarics, with the exception of the infamous Yellow Stainer, are safe and good to eat. The Macro Mushroom has an excellent fleshy texture – and there’s lots of it. Don’t be put off by the slightly unpleasant, ammonia smell of the mature specimen, this disappears after cooking. The taste is surprisingly mild although pleasant; similar to the button mushroom supermarket variety (a young variety of Agaricus bisporus). They’re definitely worth eating though. I always make sure I never ‘over pick’ my find and leave several behind to continue in their reproduction. Lovely. Agaricus urinescens – The Macro Mushroom – Notice the yellow-brown scaling on the cap and the grainy/scaly base of the stem. The margin will become toothed or even split apart. 8-30cm across. Initially rounded/convex. Covered in yellow-brown scales. Margin is toothed; often splitting. Smell of almonds in young specimens then has an odour of ammonia as it ages. 5-10cm x 2.5-3.5cm. Creamy white with fine white particle coating (easily removable); more scaly towards the base. Whitish-grey maturing to dark brown (no pink colouring at any stage). Spore Print: Brown (see how to take a spore print here). Happy (belated) new year to you all! Things have been very busy for me pre-Christmas, hence the delay featuring this lovely and edible treat I found in November, even though it can often be seen in the winter months! I’m so happy to have found this mushroom recently as I don’t see much of it nowadays. It has patchy distribution throughout Europe and is notably harder to find than our reliable Wood Blewit (Clitocybe nuda / Lepista nuda). However, I hope you do come across The Field Blewit or Blue-leg (Clitocybe saeva / aka. Lepista Saeva / Lepista personata) pretty soon too. It is one of the more highly prized wild edible mushrooms to be found. These two conspicuous ‘Blewits’ look very similar but have a few notable differences. Firstly the most obvious difference is that the Blue-Leg is found mainly in Fields/pasture (as you would expect with such a name!) but it can reside close to woodland in grassy hedgerows (as in this case) or even gardens. They’re usually found in Fairy rings, but I don’t see much of that. My bad luck I guess. 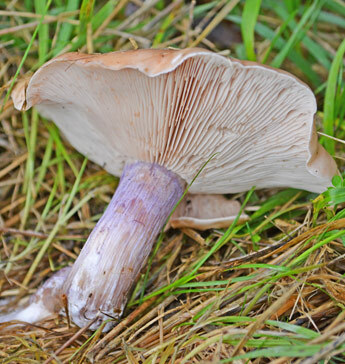 The smooth, large cap of a mature specimen (often with a wavy margin) is pallid brown in colour, unlike the Wood Blewit which has a distinctive violet hue. The gills are similar in their crowded, fleshy appearance but have different colouring; the Field Blewit’s gills are whitish when young, maturing to a ‘pale flesh’ colour, unlike the violet tinge present in the Wood Blewit. The streaky coloured stems however (or ‘Legs’ in this case) are very similar. The Field Blewit has a strong violet shade, which is bizarre considering they’re known as Blue-Legs – but there you go, I don’t make the rules! The contrasting light brown of the cap and strong violet stem is quite distinctive. The Field Blewit is superior in flavour to the more common Wood Blewit, and apparantly they both store well in a freezer for future consumption. Yum. Have a good new year and here’s hoping you have good foraging fortune. (P.S. Look out for Jelly Ear which is more conspicuous this time of year – they’re great for stir fry with a wealth of health benefits. Enjoy). The Wood Blewit, also known as Blue-Leg with its distinctive bluish-lilac coloured stem. Gills are flesh coloured in mature specimens. 6-12cm across. Smooth, pale brown and fleshy. Flat to convex, sometimes with a central depression as it ages. Wavy edged with age. 3-6cm x 1.5-2.5cm. Violet/lilac (bluish) and fibrous. Sometimes swollen at base. Fleshy, crowded. Sinuate. Pale whitish when young. Flesh colour when older. In pasture/fields, grassy hedgerows. Sometimes gardens/orchards. Autumn – early winter. Edible. Excellent – Cook well. With a common name such as this, it’s understandable to be a little suspicious of this small brown mushroom. In actual fact, it is perfectly safe and edible (although not much to write home about) but can be eaten none the less and they’re a very common site from late summer right through to early winter. The Deceiver (Laccaria laccata) or Laccies as they’re know in the USA I believe, will often be found in large scattered troops in woodland and heathland. They’re small and well disguised but when you first discover them, the odds are you may have trampled several already. Stopping to observe the surrounding area; they will seem to magically appear around you in their dozens! The common name ‘Deceiver’ derives from their tendency to have extremely variable cap shapes and colouring, but as I’ll explain, most characteristics remain uniform and after a time you become accustomed to their subtle traits. So, cap first, this is the variable part. Size, shape and colour can differ dramatically but from an early age they are convex and a rich orange-brown. They eventually flatten out often becoming distorted and wavy, usually developing a central depression. They’re also hygrophanous, meaning their colour (and the straitions at the margin) are affected depending on how hydrated they are. With a loss of moisture the caps become much paler in varying degrees (see images below) and the striations are not so prominent. So as you can understand, the different colours and shapes can cause some confusion in identification. But the consistent features are their thick and widely spaced gills, quite distinctive for this genus; pinkish in colour, dusted with white spores when mature. The stem is similar in colour to the cap; tough/fibrous and often twisted or compressed. Again, this is a very distinctive and reliable feature. If the stems don’t appear this way, simply look around for more examples – there will plenty about. 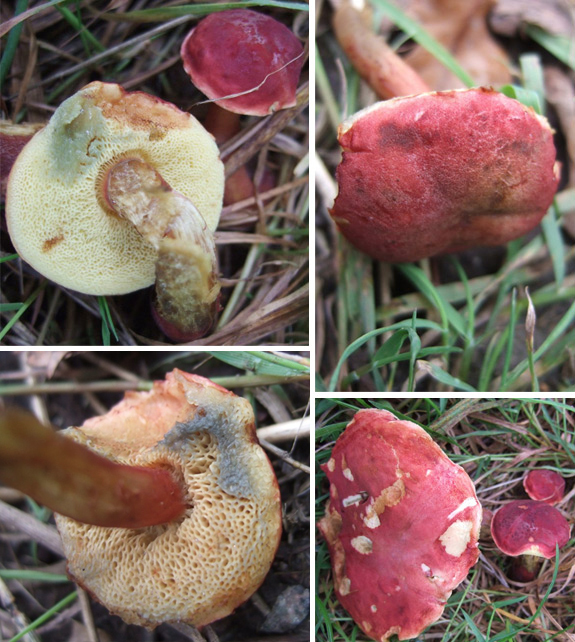 There are several other Laccaria species out there, but L.laccata is by far the most common. You may have also come across a close ‘purple’ relative of the Deceiver, namely the Amethyst Deceiver, an exceptionally attractive little mushroom. See my post on it here. Keep a look out for them this autumn /early winter time and try to avoid stepping on them at the same time, which is not as easy as it sounds! The Deceiver has variable cap shapes and changeable colouring depending on moisture levels. It will fade in colour when dry, but will be rich brick-red when hydrated. Also notice the thick and widely spaced gills (bottom right). 1.5-6cm across. Initially convex / tawny or orange-brown when young. Flattening with age, often wavy edge and depressed centre. Hygrophanous; fading colour as it dries, striations more prominent when hydrated. Flesh is thin, orange-brown. 5-10cm x 0.5-1cm. Similar colour to cap. Tough, fibrous and often compressed or twisted. Pinkish. Relatively thick and widely spaced. Mature specimens show a dusting of white spores on the surface. In woodland and on heaths, in trooping/scattered groups. Summer to early winter. Edible. Not really worth it. • Small, variable cap colours and shapes (often slightly scurfy). • Relatively thick and widely spaced gills. • Tough/pliable stems often covered with down. There is no danger in mistaking this fungus with any other. Nothing comes close to its unique size and appearance. Everyone should feel lucky if they ever find any of these beauties in their prime. I only have the occasional luck here and there. They’re either too young, too old or vandalized! Late summer and autumn is the best time to go hunting for them. 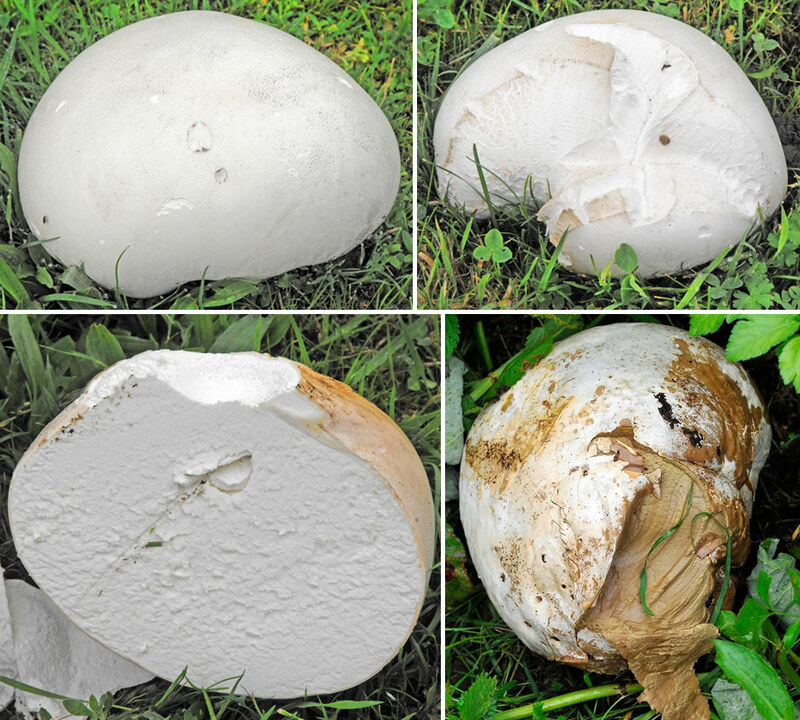 The pictures of these magnificent Giant Puffballs (Calvatia gigantea) were kindly supplied by Brian Friend (excluding the header & bottom right image) taken in his garden in Stickney, Lincolnshire. My discoveries to date haven’t been particularly photogenic, so many thanks again Brian. So here were not just one, but several Giant Puffballs in a long line – or so it seems. They are actually part of a large partial ring. The averge puffball size I would say would be approximately 20-23cm in diametre (around 4kg). They could also still be in the process of growing even larger. Mature specimens can reach up to 80cm across (approx. 20kg) or even larger in some exceptional cases. Apart from hedgerows and woodland edges, it is gardens and pasture land that are the most common habitat for this fungus, often found in full or partial fairy rings (as in this case). The outer skin is white or creamy white and is firm and leathery to the touch. The inner flesh contains a dense white spore mass, known as gleba. These young reproductive spores amount in excess to around 7-8 trillion – and sometimes more. That’s one determined fungus keen on reproduction! However, only a couple of the spores may find purchase and reproduce elsewhere. Maybe this is not a bad thing, otherwise we’d be knee deep in them every autumn. With age, the skin rots away and peels, leaving the now mature olive-brown spores to be released. This is further helped when the whole fruiting body becomes detached from it’s relatively small mycelial attachment (small white root-like appendage) and is free to roll ‘not-so-gracefully’ over the surrounding grassland. The Giant Puffball can reach up to 80cm across. Older examples peel open and release the mature brown spores within (bottom right). In one of my recent posts I featured the lovely Poplar Fieldcap mushroom, where I mentioned I had come across another Agrocybe just a few weeks before. I had actually discovered these right at the end of May and have had emails and Tweets from people finding them right around the same time. But you can still keep a look out as their season is from spring to summer (up until September). Summer is nearly at an end and the mushroom season in autumn is nearly upon us, but I had to feature this particular species before then. It is commonly known as the Bearded Fieldcap (Agrocybe molesta or A.dura) and can be found in a range of similar-ish environments, such as grassland, grassy verges, meadows, scrubland, grassy/green woodland areas, gardens, and as in this case, newly prepared crop field (sweetcorn) with rich soil and some very happy weed greenery. It’s because of this location that I had an issue with identification. Does it actually grow here? Is this normal? or has it been documented? Questions, questions. On close examination (non-microscopic) all evidence was pointing to what is definitely a Fieldcap (Agrocybe). But I have since discovered from colleagues and research that, yes, this is quite an acceptable abode for our bearded buddies. In fact, the mycelium (the vegetative part of a fungus) could quite have happily been transferred via the nutrient rich, composted soil, to end up on this stretch of land. I’m guessing the unwanted greenery and collection of weeds were unwelcome too, but in no way have they halted the development of the corn (which by now is in good form as I saw the other day). So, unburdened by legions of corn at this time, this fine scattered colony of Fieldcaps were ripe for the picking. Right of way through this filed is allowed I may point out, just in case you’re thinking I’m a forager gone naughty! The cap when young is very convex, eventually spreading out to a flattish shape – smooth in texture. The margin (edge) remains slightly inrolled, often showing hanging white veil remnants – hence the common ‘bearded’ name. The colour is very pale ivory white to creamy tan with a smooth surface that often cracks when dry and old. The margin usually splits in places too. At first glance, the general appearance is that of a typical Field Mushroom (Agaricus campestris), they even smell similar – but there are subtle differences, more noticeable when you study the gills and stem. 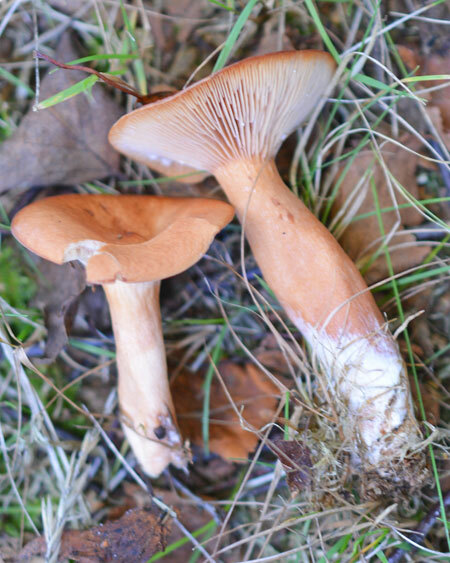 The gills when young are pale but soon mature to a darker clay brown, unlike Field mushrooms that are initially pink, maturing to chocolate brown. The solid stem is cylindrical and concolourous with the cap. The ring is high up near the apex and often leaves a smooth fibrous, white veil covering from here to where it meets the cap. Apart from our Poplar Fieldcap (which grows in association with willow/poplar trees) there is an extremely similar and more common species known as the Spring Filedcap (A. praecox), which shares the same season as the Bearded Fieldcap but has a smooth darker cap which rarely cracks or breaks up on the surface – and also has no ‘bearded’ appearance at the cap margin. It prefers grassy locations in parks and woodland edges. 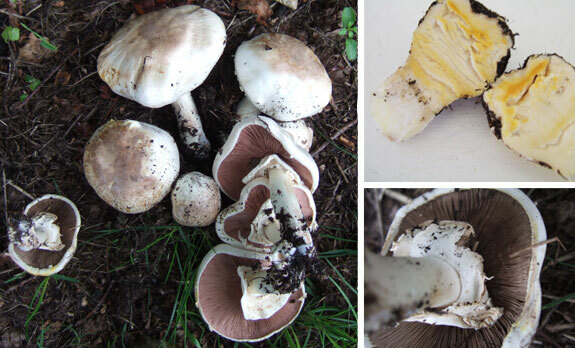 Either way, these species are all edible, and I knew Agrocybe molesta was going to be a ‘taste and see’ exercise as there are mixed reports on taste etc, and no-one I know has actually eaten any. Just like the Poplar Fieldcap, I was pleasantly surprised with the younger specimens which were nice and fleshy with a mild mushroomy flavour. Some others, mainly the larger/older ones were quite bland though. A little watery and pretty tasteless (even very slightly bitter). There may be some still about at this time. At least now you know what to look out for. Happy hunting. Agrocybe molesta – Ivory white to Creamy tan coloured. Pale clay brown gills mature darker and the white ring is high on the stem, sometimes discoloured brown from falling spores. Note in the very top image on this page the ‘veil’ remnants at the edge of the cap, hence the common name ‘Bearded Fieldcap’. 3-9cm across. Whitish – tan. Convex then flat, often crazed pattern when much older. Margin inrolled often with white veil remnants. 4-8cm x 0.3-1cm. Creamy white when young, darker with age. Felty and firm with ring near the apex. Adnate. Pale then dirty clay brown with age. In scattered tufts in meadows, grassy verges, sometimes in scrubland, in rich soil of fields. Late spring – autumn. Edible. Ranging from mild to bitter. Younger ones taste nice; very ‘fleshy’. This is my second find in the same month of two different species of Agrocybe, but I’ll focus on the latter example here. Although its common name suggests its habitat, the Poplar Fieldcap (Agrocybe cylindracea or Cyclocybe cylindracea) only grows in association with trees, namely Poplar and Willow – just like our native Black Poplar as in this case. (More info on identifying the Black Poplar here). It’s really not that common but has an ‘all year round’ season, and rather than being seen with trees, it can also be found out of its natural surroundings such as on rotting wood mulch and garden chippings. I found this small collective at a local park that seemed to be growing in the grass, near a Poplar tree. As I always say, check out the environment, because at first glance some things can be deceptive. On closer inspection, the stem bases were actually attached to the gnarly roots just hiding beneath the grass, embedded slightly deeper in the soil. This fact alone helped as a great clue to its identity. I caught them a little late though. 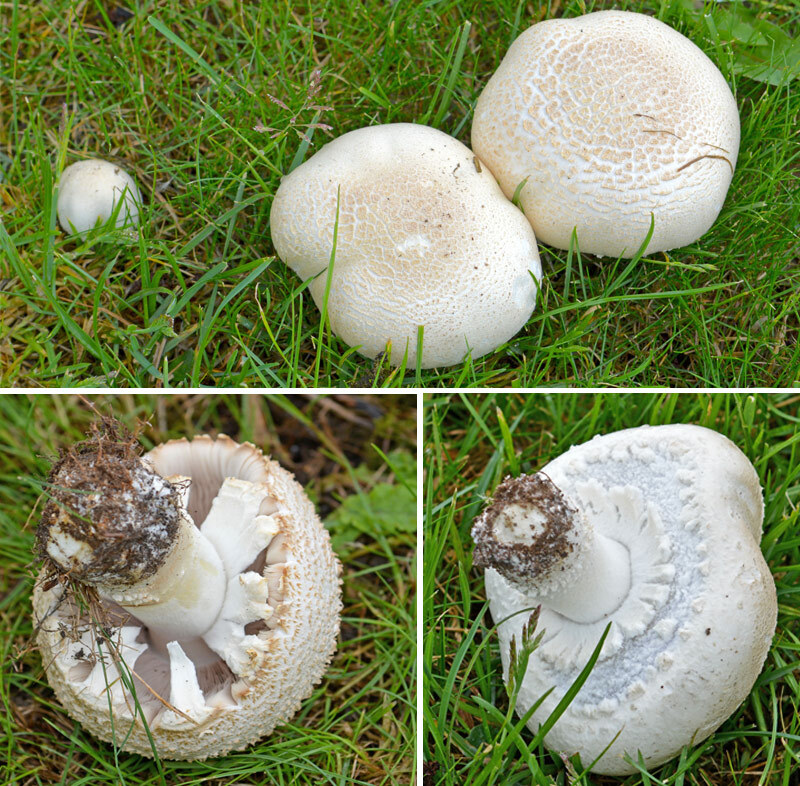 When younger (as you will see in some of the pictures below) the whitish/pale buff caps are rounded and smooth and range from 4cm to 6cm across. After a short time the caps expand (up to 10cm approximately) and often dry out to leave a ‘crazed’ surface pattern and the margin often becomes wavy and split. Initially the adnate (or slightly decurrent) gills are pale but soon mature to dark tobacco-brown as the spores mature. These mature spores will fall onto the persistent ring beneath, leaving a dirty brown stain on the upper side. Although edible I don’t hear much about what people think about them. I simply assumed they were just not held in any high regard. But after sampling a couple of the younger, more fleshy samples, I was pleasantly surprised. The smell and taste is typically ‘mushroomy’ but much milder with a ‘nutty’ hint. Very nice indeed. I would definitely recommend them. So, for a species that isn’t terribly common I was lucky to find these… Well, actually I was told about them by a friend. It’s pays off when you ask all your friends and family to keep a look out. All those extra pairs of eyes are very useful. Happy hunting. Top: Notice the spores that have dropped onto one of the younger caps, leaving a dark brown stain. A.cylindracea often grow in tight overlapping groups. The cap flattens out with age and splits at the margin. As it loses moisture and dries out, it develops a ‘crazed’ surface pattern. 4-10cm across. Pale. Whitish with yellow-brown centre. Darker with age or brown from spore deposits of other mushrooms. Rounded at first, maturing flat and often cracking. 5-10cm x 1-1.5cm. Creamy white. Darkening with age. Persistent ring often coloured brown on the upper side by falling spores. Adnate or slightly decurrent. Initially cream, maturing to tobacco brown colour. Spore Print: Tobacco brown (see how to take a spore print here). In groups, sometimes overlapping, growing with Poplar and Willow. All year. Edible. Mild and slightly nutty flavour. A walk though the park today I was pleasantly surprised to find many small yellow and slightly larger pale mushrooms peppered around in the short grass. And as I suspected, these were actually all the same mushroom species, just in different stages of growth. Credit: Caroline Hooper, Gloucestershire UK. The Yellow Fieldcap (Bolbitius titubans) is a very widespread and common little mushroom, fruiting during summer to autumn, but I often see them in mid-late spring time too, as in this case. It mainly frequents well manured grassland but is also found on rotting straw, manure, dung and wood chippings. When very young, its small cap is distinctly rounded, elliptical or sometimes ball-like and is a striking bright yellow colour. It also has a slimy surface texture which sticks to your finger after a gentle prod of the cap! As is grows, the cap opens into a bell shape and eventually spreads to almost flat. During this process, the viscosity fades as well as the chrome yellow colouring until it is nothing more than a pallid straw colour or greyish-white. Some yellow however does remain (for a while) at the very apex of the cap, and the margin becomes noticeably striated and very thin. The gills on the underside are pale yellow and quite crowded. With age these change colour too, becoming light brown and eventually rusty brown. This is a good identification feature to look out for on older specimens. The hollow stem, just like the cap, is very fragile and is relatively long when compared to the size of the cap (this can be helpful for locating them amongst the grass to be honest). On closer inspection you’ll see it is covered in fine white powder and more downy at the base. And as a quick sign off, it’s interesting (albeit a little confusing) to know that although the common ‘Fieldcap’ name is used, the Yellow Fieldcap isn’t actually part of the Agrocybe genus, which are commonly known as Fieldcaps. So make of that what you will! Different ages: Bottom left – Very young chrome yellow, viscous cap. Top left – Middle aged fading yellow cap. Top right – Yellow gills mature deeper brown. Bottom right – Old and faded cap with distinct striations. 1-5cm across. ball shaped or elliptical and chrome yellow when young. Pallid yellow to greyish white, bell shaped to almost flat when older. Striate margin. Thin, fragile flesh. 3-10cm x 0.2-0.4cm. Pale yellow or whitish. Hollow. Covered in fine white powder. Downy base. Adnate to free. Crowded. Pale yellow maturing to light brown, then rusty brown. Spore Print: Rust brown (see how to take a spore print here). Manured grassland, rotting straw, dung, wood chip. Mid spring through to autumn. 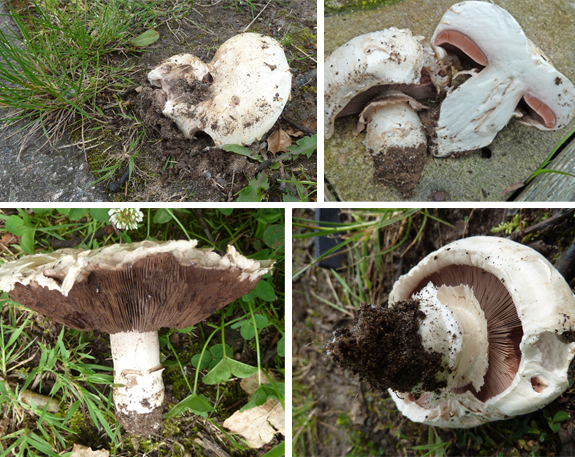 Right now there are quite a few Agaricus (mushroom) species. I have already seen many species in varying urban habitats. I was especially lucky when I stumbled across these beauties literally round the corner from my house on a large grassy verge. 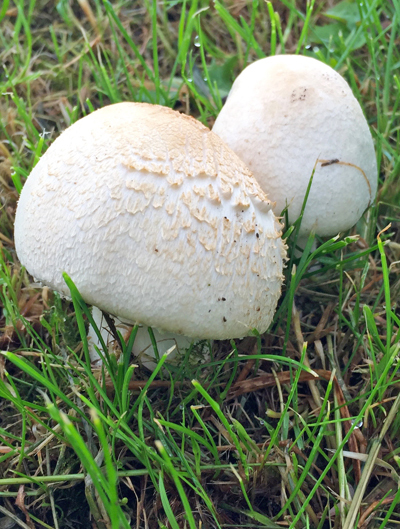 The most welcome Horse Mushroom (Agaricus arvensis) is a great tasty mushroom that grows in most types of grassland, mainly permanent pasture land, but to reiterate, in this case it was a small grassy front lawn/verge. They’re often found growing in large rings and this was no exception, even though it was only a partial ring. Still plenty to go around though. The word ‘Horse’ used in the English name doesn’t reflect on where they can be found, such as fields with horses in (which is a common misconception) but is in reference to their large size. The largest in this group was 15cm across, the size of a small plate. 20cm is the maximum size on average and even at these dimensions, they are still relatively fresh and ready for the pan. If you find what appears to be a Horse Mushroom, but has a 30cm diametre cap, then you’ve probably found a Macro Mushroom (Agaricus urinascens), very similar indeed to our Horse Mushroom but slightly more scalier on the cap. That’s another story for another time. 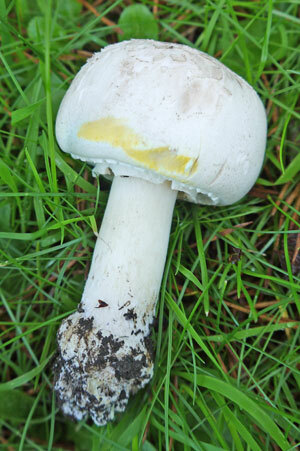 People often avoid the Horse Mushroom because of the yellow (pale ochre) colouring that appears on the cap as it ages. Some are unsure that they could be dealing with the rather unwelcome ‘Yellow Stainer’, an extremely common look alike that could cause nasty gastro upsets (read all the about the Yellow Stainer in this post). In fact, some Agariucus xanthodermus were quite happily growing on a grassy verge nearby that very day! But have no fear, the Horse Mushroom has some key characteristics that set it apart from the rest. Initially I always do the ‘Yellow Stainer’ test in which I rub the side of the cap and get the base of the stem out of the ground and snap it in half. If there’s some ‘strong’ chrome yellow colouring I simply avoid it. The Horse Mushroom has no extreme colouring like this and no colouring at all in the base of the stem flesh. If you look around and find a very young example, the gills will be veiled by the what is to become the ‘ring’ on the stem (see picture below). A distinctive jaggedy ‘cogwheel’ pattern runs around the outer circumference of the membrane. This is always a good sign. 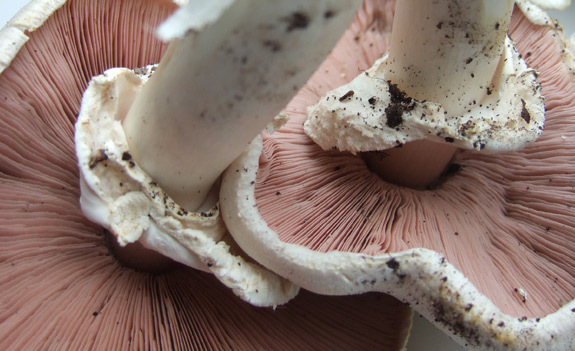 The young gills are white at first and turn pink, then eventually chocolate brown as time goes by. I found these at a good time and I didn’t hesitate at all in collecting some for my tea, leaving a few to do their thing. They eventually ended up in a lovely mushroom soup (if I don’t mind saying so myself). I hope you too have some good luck in finding these beautiful and tasty mushrooms. Enjoy. The Horse Mushroom can grow up to 20cm in diametre. Notice the ‘cogwheel’ pattern on the veil, covering the gills of the younger mushroom (bottom left). 5 – 20 cm across. Initially domed cap expanding out. Creamy white, yellowing with age. Flesh firm and thick. Slight smell of aniseed (more so when young). Veil on underside initially covers gills. Has a ‘cogwheel’ pattern. 8-10cm x 2-3cm. Same colour as cap. Often becomes hollow. Free from stem apex. White at first, then pink, then chocolate brown with age. Spore Print: Dark purple brown (see how to take a spore print here). Grassy pastures, lawns and sometimes grassy verges. Often in rings. Late summer – autumn. Common. Edible and excellent. Good mushroomy flavour. 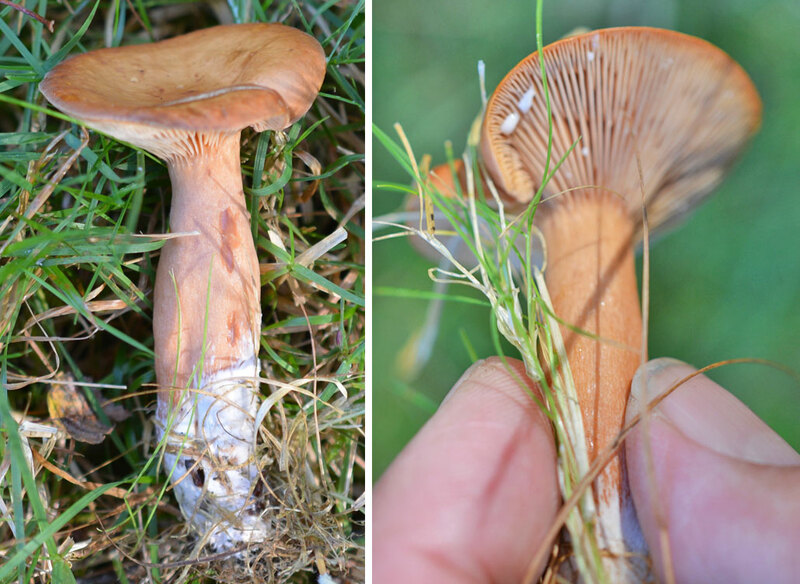 One of my latest and tastiest finds has been the Saffron Milkcap (Lactarius deliciosus) – one the most sought after Milkcaps, especially in Europe which grows exclusively with pines from summer to autumn. They aren’t overly common but relatively frequent, and to add to the fun, they are quite regular in showing up in the same place every year – but this is only in my experience, perhaps it’s not always so. I’d just thought I’d mention it (leave comments if you agree or not). 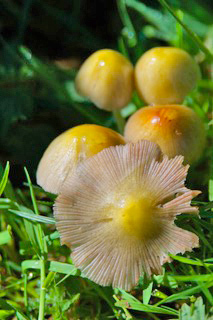 The Saffron Milkcap’s cap can grow up to 12cm in diametre and is slightly funnel shaped with a margin that is noticeably curved inwards when younger. The fleshy, carrot orange cap often shows stronger concentric bands around the surface (in this case very subtle) which can be tinged here and there with olive-green patches. Caps on the lookalike mushrooms tend to develop a wider covering of green, sometimes covering the cap completely. The milk colour is a key ID feature with this Milkcap, when compared to the others. It has bright carrot orange coloured milk (coming from the gills once damaged or handled). The lookalikes share a similar colour but are noticeably more reddish, turning deeper red/purpleish over 10 – 30 minutes minutes once exposed to the air. Moving on to the stem you’ll see the gills are only mildy decurrent and the pale whitish/orange to salmon/orange stem often has a collection of darker, circular pits, as shown in the pictures here. The False Saffron Milkcap can have these marks but are less frequent and Lactarius semisanguiluus doesn’t have any – it’s stem can clearly be seen to turn green over time and upon handling. With experience these finer differences will become more apparent but even now I sometimes don’t trust my own judgement. Luckily a colleague confirmed the finding. Always a good idea to get a second opinion. And if you’re unsure of the difference between Pine and Spruce (as I was) then this is a good link to help in identification. And while we’re on the subject of good links, take a look at this great Saffron Milkcap recipe. Enjoy. The Saffron Milkcap. Notice the darker pitting on the stem (top right) and the bright ‘carrot orange’ milk from the gills (bottom right). 3 – 15cm diametre. Varying carrot/orange colour / sometimes greenish in places. Darker markings showing concentric bands. Convex with central depression. Initially inrolled at margin. Firm, brittle consistency. Slightly decurrent. Narrow spacing. Pale pink/apricot to saffron. Eventually carrot coloured. Olive-green markings when bruised. 3 – 7cm x 1.5 – 2cm. Whiteish/pale orange – salmon coloured. Often with darker circular depressions. Green in places over time. Spore Print: Pale ochre (see how to take a spore print here). In grass with pine trees. Summer/autumn. Frequent. Edible. Very Good. Popular in Europe. 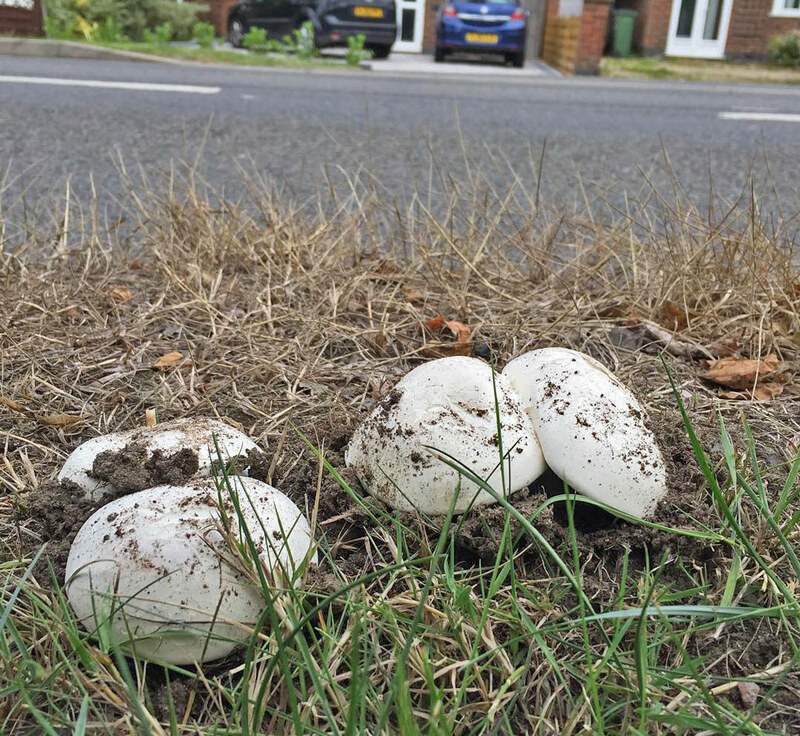 As the name suggests, the Pavement Mushroom (Agaricus bitorquis) chooses to flourish mainly in roadside situations and even gardens. But the interesting feature of this edible Agaricus is that it has the amazing capacity to push through the road (asphalt) itself. It’s proof that nature knows no barriers and doesn’t mind upsetting the local Council by wrecking the pavement. I found this small group only a few centimetres away from the kerb on a street near my home. You’ll notice in the pictures that you can see how they tend to be ‘forcing’ their way out of the ground, pushing the earth aside as they go. You don’t see this with other, similar mushrooms and it’s a good first indication (along with the location) of positive identification. The small dome shaped cap is the first thing to see, with remnants of earth clinging to the subtle flaky surface. As it grows the cap soon flattens out to around 10 – 12cm in size. Another good identification feature, especially seen when younger, are the two separate rings found on the white stocky stem (see picture: bottom right). The gills are initially a dark pink to clay in colour and finish chocolate brown at maturity. This mushroom really does smell ‘mushroomy’, is edible and quite nice to eat. But I have three qualms about eating this mushroom in particular. For one, this mushroom tends to be very mud loving and dirty so a thorough cleaning is required (I’m just too lazy!). The second is that they are often ‘bug munched’ to provide an unappetising visual appearance, and finally (by nature) they live near to the roadside. And depending on how busy that road is, I generally don’t want any pollution in my food. But this all just a good moan – they are very good indeed. A group of Pavement Mushroom (Agaricus bitorquis) pushing through the tough soil next to an urban city road. The Pavement Mushroom pushing through the soil next to a roadside kerb. Notice the double (separated) rings on the stem (bottom right) and the larger, flatter cap of an older specimen (bottom left). 4-12cm across. White. Convex/dome shapes, flattening out. Very faintly flaky. Thick white flesh. 3-6cm x 1.5-2cm. White with 2 separate sheathing rings. Free. Pink, then clay then chocolate brown. In gardens and roadside verges, sometimes out of the road/asphalt. Late spring – autumn. Although it has been a relatively bad season for mushrooms and fungi alike due to the dry weather, this last week has proved fruitful, especially in relation to Waxcaps. Because of the excellent timing, I had to feature the ‘Witch’s Hat’ or ‘Blackening Waxcap’ (Hygrocybe conica) to be my latest post. 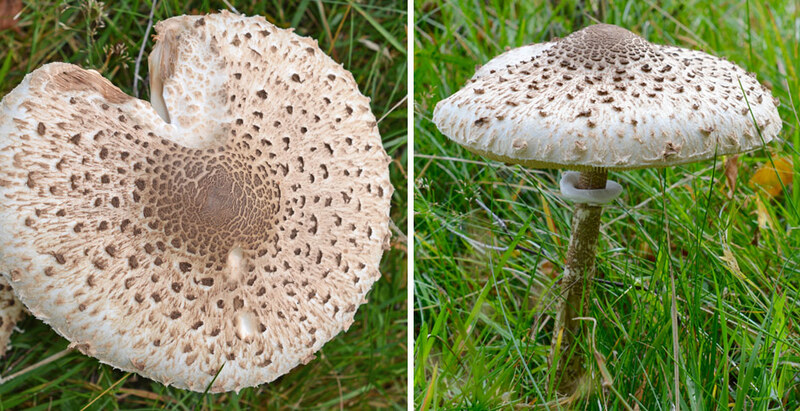 As the common and scientific name suggests, the cap of this very common grassland mushroom is ‘conical’ in shape, usually broadly conical or bell-shaped (often irregularly lobed). The texture, common with all Waxcaps, is slimy and waxy and although quite small, is very noticeable in the grass due to it’s bright and striking colours. In this case, the colour can vary somewhat, but mainly you can see yellow/orange (sometimes with scarlet shades) – even hints of green can be present. But the main feature you will recognise (again, shared with some other Waxcaps), is the ‘blackening’ effect (sounds very seasonal and horrific!). The older the mushroom is – the blacker it will get – although it does not auto-digest and turn to ink like the gills of the Inkcap genus. Very old specimens turn completely black and appear to be decayed or burnt out. If picked, you will also notice it will bruise black upon handling. But if left alone, the blackening process will slowly take effect, starting mainly from the cap edge (see image above). Keep a look out this (late) autumn and you may find some along with it’s more colourful friends. It can be found mainly in grassland in fields and woods, but is also common in ornamental lawns, waysides and even plant pots (as my mother discovered!) due to it being less sensitive to nitrogen enriched soil. Very common Waxcap, found in field or woodland grass. Bright orange/yellow (sometimes with red or green hues) that blackens with age (see far left). 3-5.5cm accross. Conical or bell-shaped. Often irregularly lobed. Waxy. Yellow/ Orange colours. Blackens with age. 3-7 x 0.6-1 cm. Yellow, scarlet flush. Blackening streaks with age. Adnexed or free. Pale yellow. Waxy. Grass in fields or woods. Ornate gardens and plant pots too. Autumn. • Small sized caps brightly coloured in reds, yellows, oranges, greens and whites. • Caps are often conical or domed and normally greasy or slimy. • Gills are waxy. Some bruise blackish when damaged. See Kew gardens conservation news on the British Waxcap family here. There are mixed reports on the frequency of this following mushroom. Some reports and publications label this as a common European mushroom, and others regard it as a rare sighting. But whatever the current reality is, I do hope you find one of these. They’re a really beautiful example of how nature, especially the world of fungi, can make things all the more colourful for everyone. OK, so I’m being a little melodramatic, but the Ruby Bolete (Boletus rubellus or Xerocomus rubellus) is a very striking and pretty mushroom. I actually discovered this last august but I thought it was about time I shared it with the world. Please excuse the poor picture examples shown here. They had been nibbled and trampled by God knows what! But at least you can see the basics and the beautiful red colour of the cap. So, whether rare, common or whatever – the usual season for this Bolete (and most other Boletes in general) is from July to November. 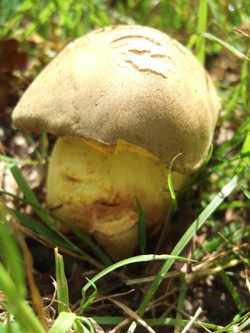 It’s a relatively small Bolete in comparison to others of the same genus. The cap ranges in width from 3 – 7cm (sometimes slightly larger), but obviously it’s most striking feature is it’s colour of ruby red and/or scarlet. There also maybe tints of olive colouring near the margin. You’ll also notice there is not much colour change in the pale yellow flesh from the pictures – but there is a colour change on the underside (ie. the pores). As with all Boletes, there are no typical mushroom ‘gills’ to speak of. They have pores (the open holes from the tubes within the cap). They appear to be maze-like and/or angular and be small and condensed together or quite large and spaced out. In this case it is the latter with the added feature in which it slowly ‘bruises’ blue. Press your thumb on the pores and see the colour change before your eyes. Great and weird all at the same time. If the red cap and blue staining isn’t enough for positive ID, then take a look at the stem which is slender, often quite tall (up to 8cm), coloured yellow/orange with streaks of red. It is more chrome yellow at the top and duller towards the base. If you slice it in half (vertically) you’ll see the flesh at the base to be speckled with orange flecks. Colour all the way!! They are edible but unfortunately not really that good. Perhaps younger specimens in a mixed mushroom dish might work, but I gave this batch a miss this time. Too nibbled and mashed! You can find these special little gems in damper areas around broad-leaved trees in grassland, including local parks. Try to get there before the slug munchers though, unlike me! 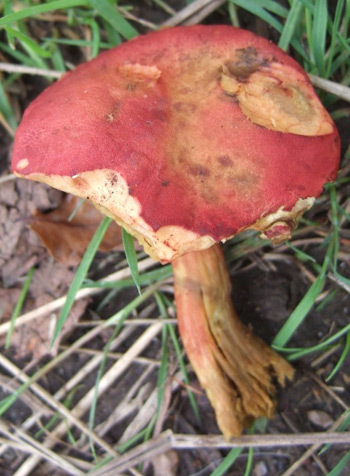 The ruby red cap of the Boletus rubellus – notice the blue staing on the pores. Note: This has also been known as: Boletus versicolor, a name that is no longer used. Spring has arrived and the clocks have gone forward. And like most people, it tends to make me feel a whole lot more happy about things in general. Even so much so that I actually mowed my lawn since before Christmas. This is a good thing, because shorter grass will bring out those early spring mushrooms. Guaranteed. OK, so these little babies aren’t edible (but neither poisonous) but it’s good to see nature once again spring into life (excuse the pun! ), especially when it’s literally in your own back garden. I’m talking of the common Turf Mottlegill (Panaeolus fimicola or Panaeolus ater). The Mottlegills are a family of small to medium small mushrooms that can occur from spring or summer through to autumn and/or early winter. They get their common name from the ‘mottled’ appearance on their gills (when younger) as the black reproductive spores ‘unevenly’ mature. These little beauties can pop up in their dozens all around in the short grass, and are initially very hard to spot. I think most of time they go unnoticed. Their caps, when young, are around 1cm in diametre and can grow up to 4.5cm. But if they’re on your own lawn they don’t really last long and get knocked down or crushed. Poor things! As with many mushrooms, their appearance can change as they mature. In this case it is the colour of the cap and gills. When they first appear, their button small caps are a lovely dark brown (especially when wet) and their gills are a very light brown/greyish colour. After a couple of days the cap dries a paler tan colour, from the edge of the cap inwards. So you can really get some different brown colour combinations going on. Also, to help with identification, the slender brown stem (around 2-5mm thick) is covered in a very fine white ‘frosty like’ down. All in all, these are lovely little spring mushrooms, which carry on popping up all the way through until autumn. And as I said, don’t worry, they’re not in the least bit poisonous. They’re too cute for that! Even though this mushroom is not edible, as always be cautious. There are very similar Panaeolus mushrooms that are poisonous. 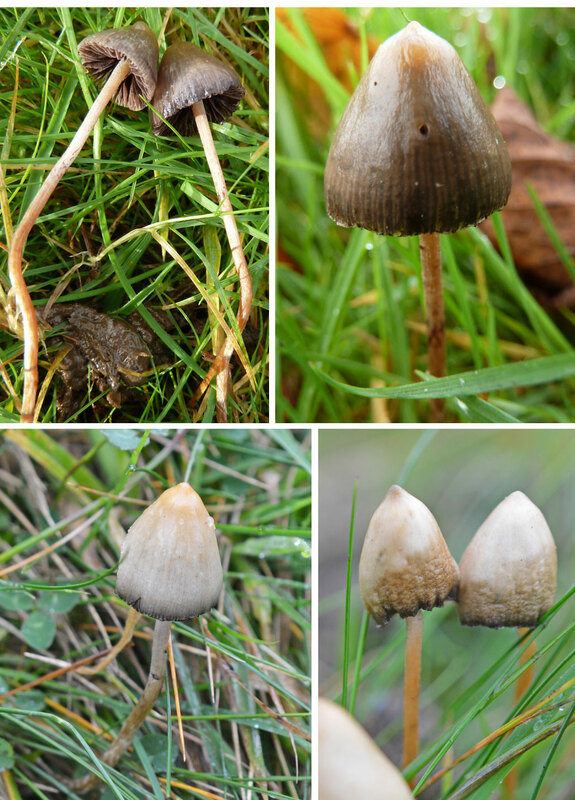 For example, the common Brown Mottlegill which appears from June to November has been known to contain psilocybin (the psychedelic ‘magic mushroom’ cocktail) which can cause unpleasant symptoms. In fact, even the famous ‘Magic Mushroom’ although not deadly has (and recently discovered) sinister twins which are very dangerous in ways of attacking the liver. It’s best to avoid all these kinds of mushrooms and stick to beer! Hoorah! • Small pale or brown mushrooms. • The spores mature unevenly; giving a ‘mottled’ effect on the gills. The Field Mushroom (Agaricus campestris) is often found in small groups or even rings (though not always, as in this case) but is found commonly in older pasture land and grassland in general, but nowhere near trees of any kind (at least 20 metres from the tree line anyway). I just wanted to point out and exaggerate the identification tips of this beautifully edible UK mushroom. 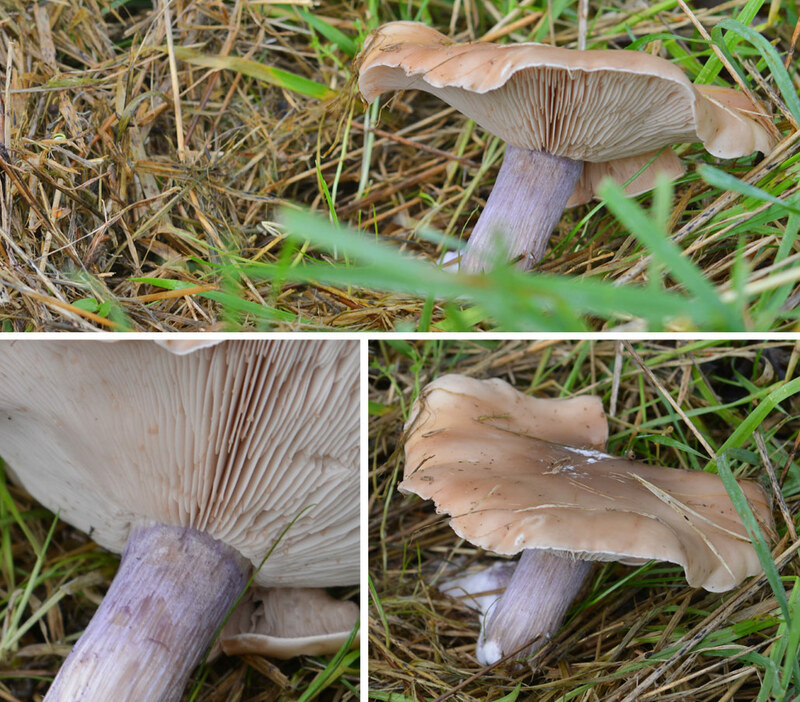 As well as the typical large white ‘mushroom look’, I’ve shown in the pictures the distinctive pink gills of the younger mushroom (these mature to dark brown), and the ring zone two thirds up the stem, which is very small, sometimes indistinct! So this helps in identification, as the Yellow Stainer mushroom; a sinister (but not deadly) looalike has a much larger, floppy ring zone. See my post on the Yellow Stainer mushroom. Younger and older examples of the Field Mushroom. Notice the slightly scaly white cap. Well, this weekend autumn has certainly stamped its initial authority on the land. Some leaves have already fallen in areas around the urban edges of my town. But I am a die-hard lover of fresh autumn mornings. There is still the summer warmth clinging on, but that zingy freshness of autumn is making itself known. 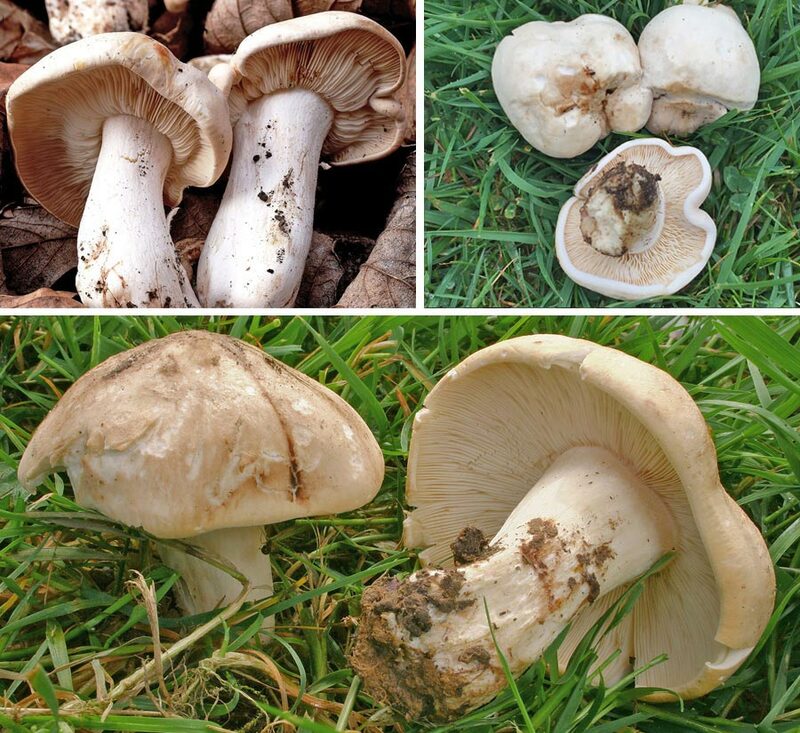 A call from one of my friends (literally working up the road at a school) was my waking alarm clock this morning – “We’ve got lots of white mushrooms going on here, a lot of them eliptoid shaped! Come and have a look if you can”. Well, it doesn’t take much to get me interested in a free meal, and I always love it when my friends let me know of any mushroom discoveries going on. Bless them. And as I work for myself, I wasn’t going to upset the boss by being late for work. So, at just gone 9am, on a lovely misty autumn morn, I’d arrived at his school. Lots of grass around and lots of Shaggy Ink Caps around too (they also appear abundantly in summer). After a weekend of constant drizzle it had obviously encouraged these beauties to sprout forth. Excellent. 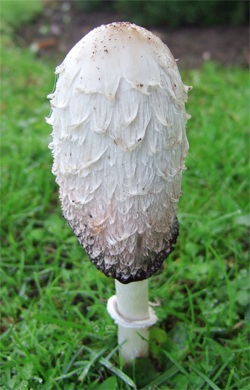 The Shaggy Ink Cap (Coprinus comatus) – (comatus meaning ‘long haired’), is (naturally) a member of the ink cap family. As they get older, the cap opens (though not out flat) and eventually goes through a stage of dissolving and releasing an inky black fluid. It’s very similar cousin – the Common Ink Cap is similar in size and shape but has a smooth surface. It can be poisonous depending if you’ve some alcohol or not! See the Common Ink Cap (Coprinus atramentarius) post – read all the details here. The common name alone gives a clue in identification to this edible and lovely mushroom over it’s sinister (though not deadly) cousin. Its shaggy appearance is caused by the white or pale-brown scales on its long, rugby ball shaped, cap. There is a drastic change in appearance depending on at what stage you find it. 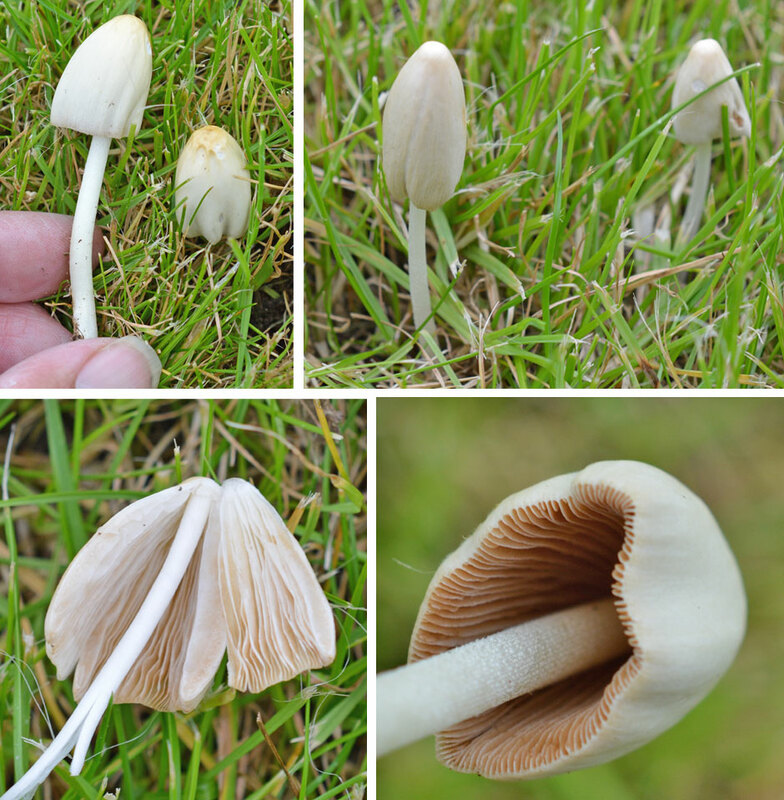 Young specimens don’t show much stem at all, in fact it can be hidden, depending on the height of the grass it’s in – and the brilliant white cap is unblemished, though sometimes showing light brown colouring at it’s tip (which persists). But as it grows older, the cap opens up and then shrinks, as it slowly dissolves into inky black oblivion! I know that sounded a bit dramatic but I thought I’d get the point across. A lot of people, on first encounters, see the younger specimen and older specimen as a different mushroom. And I really can’t blame them, they appear so different. A spore print for identification is not needed I think though. This mushroom speaks out loud for itself, and if you find it later in life, its obviously going to have a ‘black’ feel about it! It has a good salty flavour and is definitely worth a taste, I love it. Try it out, it’s a wonderful mushroom*. Look out for it this October, not only in grassland but on roadsides and disturbed ground even at woodland edges/woodland vegetation. And if you fancy it, also take a look at using this ink for literary purposes and make your own ink! Great stuff. Always try a little sample if you’re trying an edible mushroom for the first time, just to see if it agrees with you. The first time I tried this lovely mushroom I had a mild reaction of little red bumps in my mouth and what felt to be a slight hot flush! There was no unpleasantness involved and wasn’t at all serious. It soon passed. It’s just good to check your body is OK introducing it to the new food. It’s just like eating abroad really! 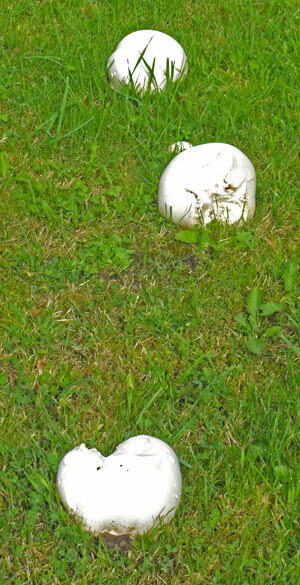 This mushroom is the ‘perfect lawn’ mans worst enemy. 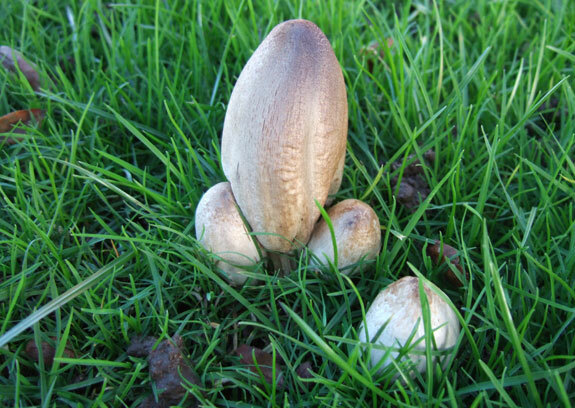 Although I love them, my dad goes spare at the sight of them – “bloody mushrooms ruining my lawn etc…” – “Natures got no rules man” was my lame hippy reply! Lawns are the main target ground for Fairy Ring Champignon (Marasmius oreades) – or at least where we may see them the most. It’s a very common mushroom around spring to autumn time. My recent discoveries were late summer (as shown in the pictures) and very recently in mid-september again in my dad’s garden (again)! ‘Champignon’ is the nice French word for ‘mushroom’. It’s a highly prized edible mushroom sold throughout Europe and USA in many markets. To the local wild picker, it can be found in short grass, lawns, parks and pasture land. It is often in rings, although not all the time. What’s this ‘fairy ring’ thing all about then? We’ve got to get into underground mycology magic for that. The mushroom is the ‘fruit’ of the underground mycelium, or organism that is the fungi (a network of fine white filaments known as hyphae). Mushrooms are born to deliver their spores in the breeding process. In short, the mycelium expands as it grows outwards from a central position. The older, central zone dies off and at the edges of this ring is where the mushroom grows. Die hard gardeners are extra miffed because the grass around the ring dehydrates and dies too (helped along by fungal cyanide toxins). The outer grass region is a nice and green affair due to the hungry, feeding mycelim. Some of these ‘fairy ring’ organisms have lasted for hundreds of years and more (not just our Marasmius oreades) and can reach up to a mile in diametre. They are are truly wonderful organisms that seem to break all kinds of records. But that’s another story for a later date. Recently, I have seen many Fairy Ring Champignons collections. Some were but a few, others in partial rings and only one as a giant ring in pasture land of about 4 metres in diametre. The caps (or heads) of these beauties are the best edible part. Just discard the stems as they are just too tough and not worth it. Make sure you get them when they’re young – you won’t make a mistake because the older ones just look unapetizing anyway! Check out recipes online. They’re also good for pickling as they hold their shape and don’t disintegrate. Hope you find as many as I have. See how the ring is formed in this patch of grass. The outer edge, where the mushrooms are growing, are stimulating the grass growth. The centre of the grassy patch will eventually die off. • Small or tiny caps with tall, thin stems. • Convex ‘umbrella’ or ‘parachute’ shaped caps. A few days earlier I had found the lovely Meadow Puffball, and now after a visit to the woods I find a nice collective group of Common Puffballs (Lycoperdon perlatum). 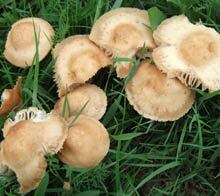 They’re mainly found in groups growing on the ground in open woodland among leaf litter, and sometimes in pastures. These particular puffballs were found at the edge of the car park growing in the soil. It was a pleasant surprise and added bonus as I made my way back to my car. If you take time to look around further you may also see some earthballs hanging around too – although they’re not really good eats at all! If you find these young beauties before they open up and release their spores, gently prize one out of the ground. Laying it down you will see that it has an ‘up-side-down pear’ shape. The main upper fruit body is rounded and the narrower lower part tapers off slightly. 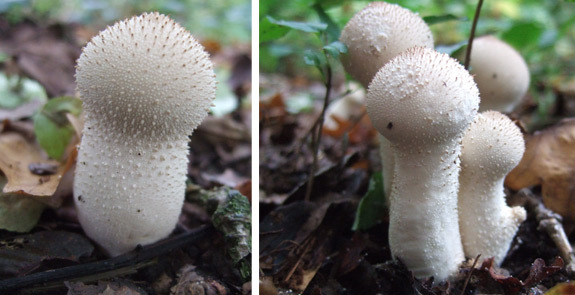 Some specimens can grow quite large up from the ground and some appear smaller with the thinner, lower body (stem, if you like) obscured from view, showing just a ‘ball’ shape. The texture is very distinctive for identifying this fungus. There are many small nodules covering the surface with larger conical/pointed spikes spread uniformly across it’s surface. The young specimen will be white with these light-brown spikes. Inside will be nice and white too. They’re quite nice to eat, usually sliced and fried up with an omelette or whatever you fancy. Problem is though, the skin can be a little tough so you must have the patience in peeling! As it grows older the colour changes to a dull brown and a hole at the top opens up to release it’s spores. Raindrops, wind or movement from a passing animal cause the open sack to ‘puff’ out its contents in a fine cloud of brown powder. If you ever see one lying around in this state (and it isn’t yet empty), give it a little tap with your finger. Pooof! Great fun – even if a little short lived. One little note I think I ought to make. Small white ball or ‘egg-shaped’ fungi can also be other poisonous toadstools in early development. For example the Death Cap starts life in a small white egg sack. I know it’s a little different to our young Common Puffball, but it’s just something to bear in mind. Be safe out there kids! P.S. Also see – The Spiny Puffball and the Meadow Puffball. My first visit to a field nearby my house in Blaby, Leicestershire on a mild august day was only slightly productive but good fun. I chose the slightly odd title of this post for one good reason – the land adjacent (separated by a patchy hedge) is one huge golf course and as I walked through the neighbouring field I heard the constant groans and cursing of the golfers searching for their missing balls! It was an odd coincidence to come across these white balls poking their heads up through the grass. No wonder they can’t find them! But wait. I was happily mistaken. These little white balls of fun were Meadow Puffballs (Vascellum pratense). On further research I’ve discovered they are common on and around golf courses, so perhaps my story isn’t that unique after all. Other main habitats include lawns, pasture and of course meadows. There were around a dozen or so sprinkled around a 2-3 metre radius. Some were on their own and some were in groups of two or three. Unlike the Common Puffball (found mainly in open woodland) their stems are quite short, so they sit ‘squat’ like in the grass and they are not as large in width either, from 2-4cm across. The surface has uniformly patterned, delicate white specks. If you touch them with your finger, the powdery-like texture smudges off to create a smooth surface. On younger specimens you’ll also notice a light yellow tone about them. These young puffballs (like most of the ‘white’ species) are edible and good. Especially nice if coated in a breadcrumb mix and deep fried. It has quite a mild flavour. If you find a Common Puffball you may have to peel the outer skin which is thicker than the Meadow Puffball. This can be a pain! But definitely worth a taste. Avoid older specimens as they taste pretty rancid, but not poisonous in any way. Best rule is – ‘whiter the better’. Slice one in half and take a look inside. It should be a nice solid white. If there are any other colours going on in there, it’s best to forget it. Have a look at the Meadow Puffballs in all their glory below. 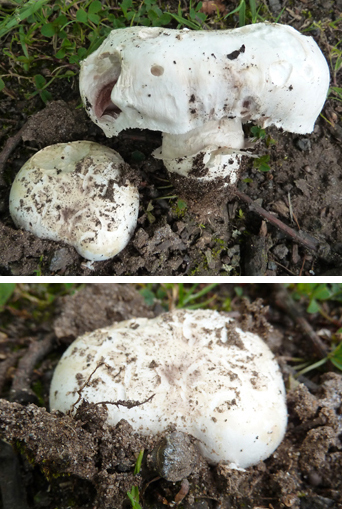 On the right is an example of an older specimen where, as you can see, turns light brown with the top broken open at maturity to release its spores. At the end of it’s days it still has the added usefulness as a pixies bath tub – or so I’ve been told! P.S. 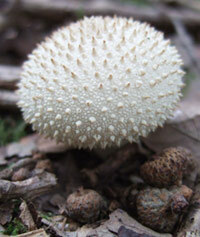 Also see – The Common Puffball and the Spiny Puffball. 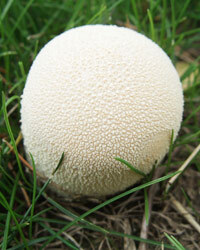 As mentioned above be wary not to mistake small white ball or ‘egg-shaped’ fungi. These could be other poisonous toadstools in early development. For example the Death Cap starts life in a small white egg sack. Slicing it in half will reveal the young mushroom shape inside though. And besides, it’s a good tip to bear in mind and keep you on your toes. Be safe out there kids! The Edible Meadow Puffball, common in grass meadows and golf courses! It’s season is late spring to Autumn. Earlier in June, my father found a group of them at the edge of his garden (near soil and a paved patio). I’ve also found them growing from peoples gravel driveways! But these beauties were found on tufted grass in local park’s car park (near gravel and paving again). So this is interesting to note – as a general rule they tend to grow near (or on) paths and roadsides mainly in short grass. It’s a medium sized yellow/ochre brown mushroom which is convex shaped which has a persistent central umbo (rounded bump) with a fine ‘fibre’ texture. As it grows older the cap flattens out and the brown coloured centre appears darker. The gills are dark brown/purple. In it’s early development the upper part of the stem is trapped within the closed cap. Being related to the Ink Cap family (see discussion of this below on Lisa’s comment), it has inky black spores which characteristically leave their mark here. When the cap opens the fibre/cotton-like veil remnants can remain (NOT web-like like a Webcap), giving it a woolly edged appearance. So why is it called the Weeping Widow? It’s a well earned name, because during moist/damp weather conditions it exudes droplets of water which many books term as ‘weeping’. Makes sense, but not as much as the Widow part!? See examples in the picture below (top left) of how the droplets form on the gills. Sometimes the best wild mushroom finds are the ones when you’re not actually looking for them. These mushrooms were only a few hundred yards from my home on a grass verge beneath an Oak tree. 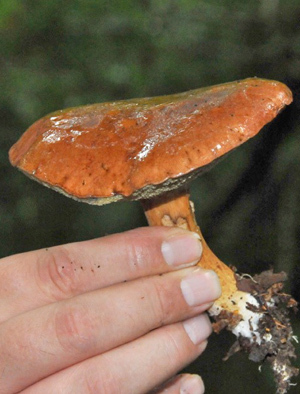 My chance discovery was an Iodene Bolete (Hemileccinum impolitum – formerly. Boletus impolitus) which mainly shows up in the Summer. It isn’t really that common either. Its appearance can be infrequent or rare. It favours broad leaf trees, especially Oak, which in this case it preferred. There were several of them in a small group, standing out like sore thumbs. I had passed them earlier in the month, while out on my bike, as their caps were poking through the growing grass. I had only glanced over at them initially. To be honest they looked just like discarded old potatoes thrown on the verge, so I ignored them. How stupid did I feel realising later my mistake!? And who throws potatoes onto a grass verge anyway? There is no staining on this mushroom when cut or bruised, which helped me identify it. Several books I looked at had shown the cap with no cracking on top exposing the yellow flesh within. But, to be fair, it was mentioned within the text. The bugs absolutely loved these shrooms – they were all over them. So after I had flicked and shook them all off I took one for myself. Knowing this was an edible Bolete I thought I might give it a taste test (not expecting a taste sensation though!). But unfortunately after slicing in half, the base of the stem was already home to many small white maggots living it up in the mushy mess they had created. Oh well! The council grass mower soon trundled across the verge, so I couldn’t grab myself another! Unfortunately. Spring finally came, and that extreme winter we’ve just had just wouldn’t let go. The natural contenders for ‘mushrooms I have to find’ were undoubtedly The Morel and the St.Georges Mushroom. But as yet – no luck on either, even after many outings. Grrrr! But in the garden and out in force though like some giant family outing, were a selection of the smaller Ink Caps – Fairies Bonnets (or Fairy Inkcap or Trooping Crumble Cap) (Coprinus disseminatus / Coprinellus disseminatus). They come out in their dozens or hundreds even! Very common and quite pretty to look at on the whole. They mass mainly around old stumps of broad-leaved trees and spread to nearby soil. The caps vary only slightly in colour, from a pale buff brown or clay grey-like colour. They are very fragile and the gills start off white then turn grey-brown and eventually turning black. 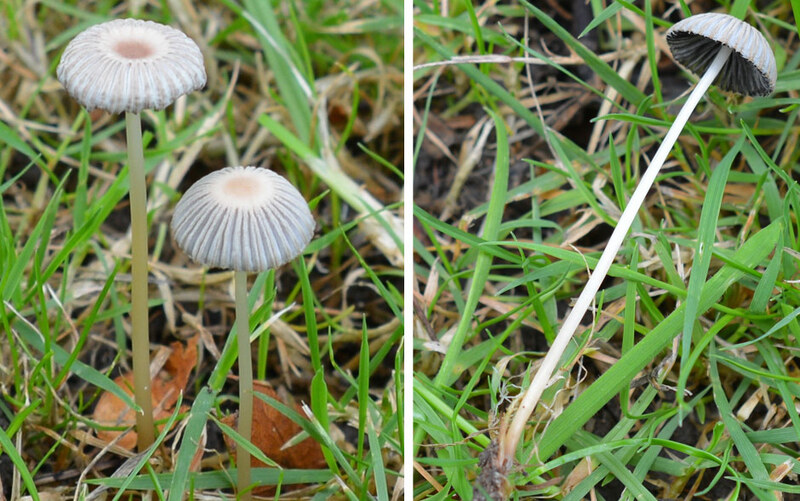 Nearby, milling around in the short grass, I find the Fairy Parasol (or Pelated Ink Cap) (Parasola plicatilis). Again, these are small and fragile, but don’t group in a large troop like our Fairy Bonnet. 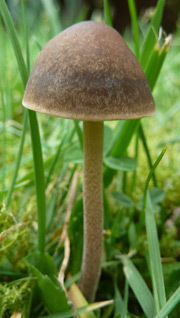 This short-lived grassland mushroom has small caps are thin and very ribbed (hence pelated) and are often greyish brown or pale greyish with a darker more brownish central zone. The cap eventually flattens out and shrivels up (within 24 hours) but does not dissolve into a black ink. You will see these in short grass in lots of places from spring to early winter. They also like to grow near woodland herbs. Pelated Inkcaps have a strongly grooved but delicate cap. They only survive for around 24 hours. And again we have another common Corpinus family member – The Glistening Ink Cap (Coprinellus micaceus). Definitely the larger and most interesting in this little collective due to the young bell-shaped ochre coloured caps are dusted with glistening, mica-like particles or grains (fairy dust I call it, just to keep us in the fairy theme!). Older specimens slightly curl and split at the cap edge. The gills, common to the ink caps, age from pale buff to brown and eventually black before dissolving into an inky fluid. (That’s when the fairies cry!). The white stems are darker in colour at the base. These are great little mushrooms and one to look out for. They’re about for most of the year, usually in dense groups on broad leaved tree stumps or feeding off dead tree roots. Shine on! These pics were taken by my dad after maiming them while trimming the grass! And to sign off, please that these mushrooms are all edible but the stone cold fact is that they are too insubstantial, bland in flavour and poor in texture. Hey ho! • Most species gills dissolve into an inky black liquid as the black spores ripen, Amounts of ink vary. Well, there’s been some heavy weather this month. Not so good for some of the country with dire floods and really dangerous conditions. In my home town, Blaby, Leicester it’s been heavy rain and wind but fortunately with no unfortunate consequences. 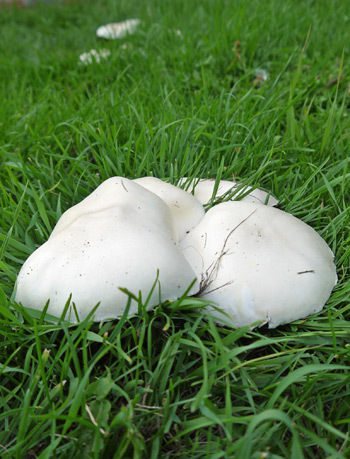 Only a few days ago though, this rain has promoted the popping up of many, and I mean many Field and Horse Mushrooms. I actually didn’t go out mushroom hunting for these (hence the weather being too blustery). They were in a field right next door to my father-in-law’s house. So, while out walking the dogs he harvested the goods. Half of which he gave to me. 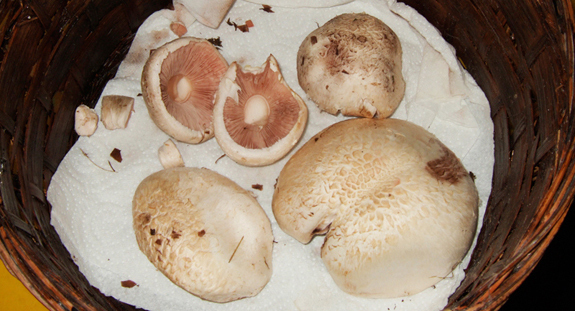 Here’s a picture of some of the Field Mushrooms, stems removed, ready for the pan. Wild mushroom hunting. Edible Agaricus mushrooms. Young(ish( Field Mushrooms. 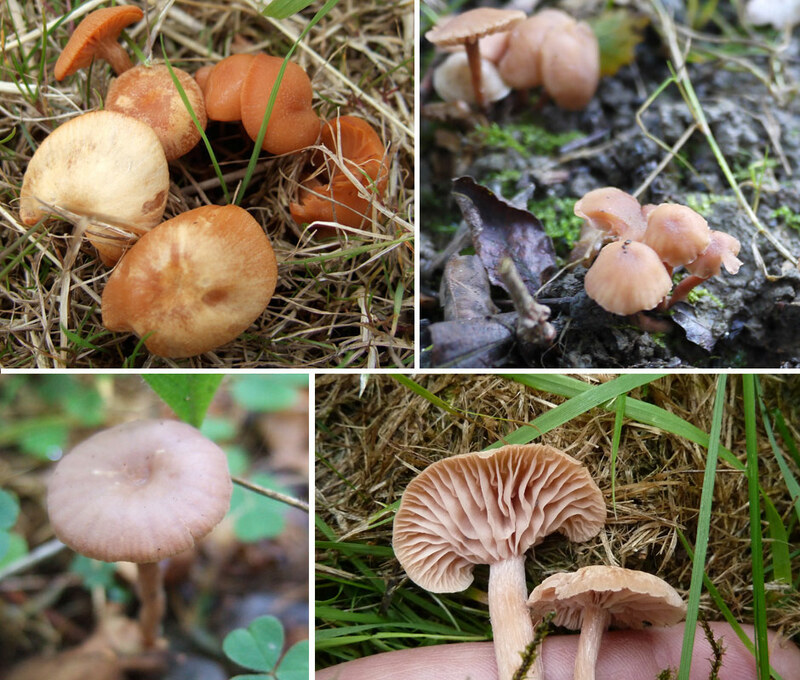 Welcome to the fungi foraging blog – ‘Mushroom Diary’. My name is John Harris from Blaby, Leicestershire, and since becoming an enthusiastic disciple of the mushroom hunt (both for food or simple curiosity in identification), I decided to log all my excursions, fungi discoveries and general musings right here on this mushroom blog. Anyone who stumbles across this blog is free to leave comments and information on all blog posts. Your input is most appreciated. I have been seriously hunting mushrooms for many years and keeping notes and photos here will help myself and others build their knowledge further in identification and understanding mushrooms. As this blog grows, I hope it will also act as a good reference point for the budding mycologist. I have many mycology reference books which are marvelous and I join several local forays throughout the year. To add to this, via online communication, I believe this blog will be a great educational/feedback tool for and from fellow mushroom hunters out there, either in a crisis on identification or just sharing great finds and tasty cooking tips. I hope you enjoy your visit here just as much as your foraging out there – in the wonderful world of mushrooms. Disclaimer: Please do not treat this site as a definitive mushroom identification source. Please use specialist identification books and/or an experienced professional’s advice and common sense. I know you will! The ‘mushroomdiary.co.uk’ author accepts no liability for any injury or death occurring as a result of ingesting or exposure to any mushroom or fungi described or listed on this website. Copyright Licence: Please note, all photographs and illustrations on this website are under copyright (©2008-2018 – J C Harris) unless otherwise stated. Photographic additions from other people are their property and copyright to them also. If you wish to use or purchase larger/high resolution images, please contact me.